Rediff.com » Movies » Is that Deepika?!! Deepika Padukone's first look from Chhapaak is out and the actress is hard to recognise. Meghna Gulzar has begun shooting Chhapaak, starring Deepika Padukone and Vikrant Massey. Earlier on Monday, March 25, Deepika revealed her look from the film on Instagram. Sharing an Instapic, Deepika wrote, 'A character that will stay with me forever...#Malti. Shoot begins today! #Chhapaak...Releasing-10th January, 2020'. Her colleagues saluted Deepika's transformation from Bollywood beauty to acid attack survivor. While her Bajirao Mastani co-star Priyanka Chopra called it amazing, Rajkummar Rao declared the film pathbreaking. 'I'm sure this is gonna be a landmark story', Sidharth Malhotra tweeted. Varun Dhawan, Huma Qureshi, Parineeti Chopra, Vicky Kaushal, Dia Mirza also hailed Deepika and the Chhapaak crew. 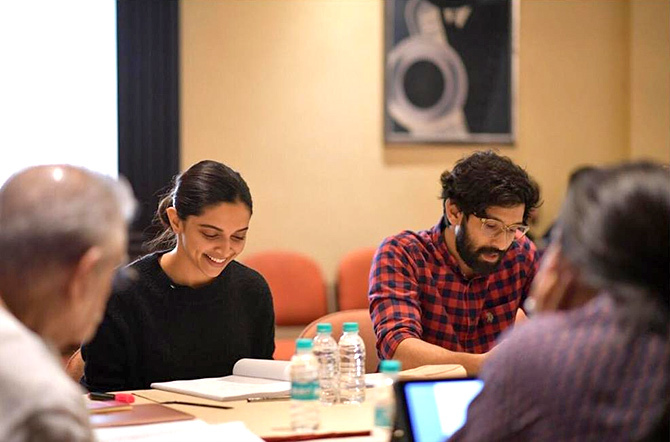 A few days ago, Deepika shared an Instapic from the script reading session of Chhapaak with Gulzarsaab, Meghna and Vikrant, and captioned it, 'All things are ready, if our mind be so - William Shakespeare #Chhapaak @meghnagulzar @foxstarhindi @vikrantmassey87'. Chhapaak is based on acid attack survivor Laxmi Aggarwal's life. How an acid attack survivor walked into the world's heart!